Bitcoin had a bumpy ride since the beginning of 2017. Last year the coin banked a staggering 1,300% return, almost reaching 20,000$ per coin on the Coinbase exchange. However, the year 2018 had not been the same, with the most popular cryptocurrency losing more than 50% of its value. According to our live rates section, the price of Bitcoin currently sits at 7,723. However, what we want to discuss today is whether there is a correlation between how the price had evolved in the period mentioned above. We will analyze some Google Trends data, in order to see how the interest for Bitcoin had evolved, correlated with the price. According to trends.google.com things do not look too good. 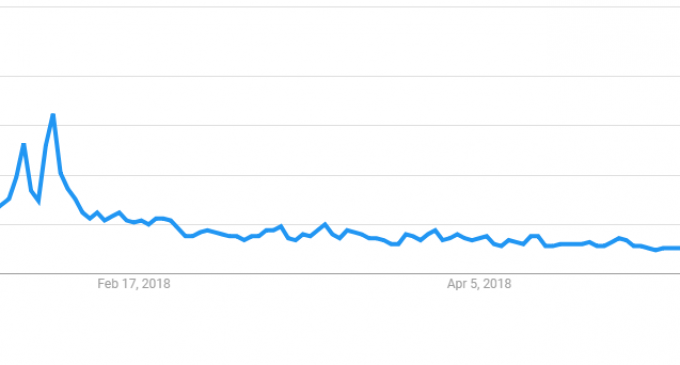 As you can see in the chart above, the worldwide interest for Bitcoin in 2018 had been steadily decreasing, in line with the drop in optimism that had been generated by huge positive returns in 2018. A value of 100 is the peak popularity and we can see that the current value is far below that level, being located at 10 currently. We can say that the crowds had been euphoric during the 2017 Bitcoin boom and now as the price continues to weaken, the interest for Bitcoin is also dropping. Other cryptocurrencies face the same situation. Interest in Ripple according to Google Trends had a worse performance compared to Bitcoin, dropping by 87% since January 1st. Bitcoin Cash is another cryptocurrency that faces an 82% drop in popularity, while Ethereum is down 70% in popularity. However, there are some cryptocurrencies that had gained in popularity. EOS – the biggest ICO in history, had jumped 97% in popularity only in 2018. Another indicator that shows the diminishing interest for Bitcoin is the number of new wallets. According to DataTreck Research, in April and May 2018 growth in new wallets had been around 2%. In comparison, at the end of 2018, when Bitcoin was reaching new record highs, monthly wallet growth was 7.6%. Despite the fact that Bitcoin had drawn interest from big companies like Goldman Sachs, Amazon, and GMO, we can see from the numbers above that there is a huge correlation between the price of Bitcoin and people’s interest. We also discussed this issue in an article about the price of cryptocurrencies and emotions and there we saw how the mood can shape how cryptocurrencies perform.